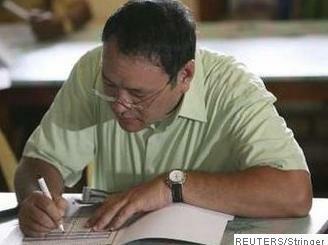 Rumors say the jueteng allegation has been taking its toll on Undersecretary Rico Puno. Of late, he couldn’t sleep, he couldn’t eat, and he couldn’t resist TV and radio guestings. Interior Undersecretary Rico Puno denied allegations he was on the take from jueteng operators… but few people believed him. That’s one of the perils of being a Puno in government. Interior Undersecretary Rico Puno has reportedly offered to step down. As of press time though, he’s still there. If he doesn’t resign in 11 days, President Aquino will take the cudgels for him. ABS-CBN’s informant revealed that Interior Undersecretary Rico Puno is one of two high-ranking government officials who allegedly receive monthly jueteng payola. ABS-CBN has declined to identify its informant… out of respect for Archbishop Cruz’ request to remain anonymous. No. 2: Look Who’s Taking! Senators are set to conduct a fresh investigation into the jueteng controversy. If nothing comes out of the probe, they’ll invite TV news executives and blame them for reporting about jueteng. Last Tuesday, senators grilled television news executives and a couple of radio news anchors in connection with the bungled hostage rescue. ABS-CBN’s Maria Ressa tried to explain their side. GMA 7’s Jessica Soho tried to defend their action. RMN’s Michael Rogas tried to negotiate. Q: What has three heads, six legs and gives conflicting statements? Q: What has six legs, four eyes, and goes Ngoorkkzz? Dapat bang pangalanan ni Archbishop Emeritus Oscar Cruz ang high ranking officials na umano’y tumatanggap ng jueteng payola? 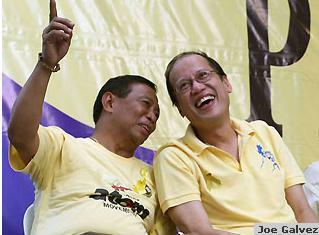 I congratulate Sen. Benigno Simeon “Noynoy” Aquino III on his victory. I accept the will of the people. I encourage every Filipino to work side-by-side with our new president… with the exception of those who are allergic to second hand smoke. I would like to thank the readers of this blog who volunteered to disseminate the information that I maintain a Twitter account. I may have failed to update my blog on Election Day but people were able to monitor my activities by following me on Twitter. Today, I concede. Yes, I concede that Noynoy Aquino is a more entertaining subject than Manuel Villar Jr., Joseph Estrada, or any other presidential candidates. His victory is just the beginning. There’s so much work to do. There’s a lot of Noynoyisms to write about. Let us celebrate democracy and let the heckling flourish even more under his administration. Mabuhay ang sambayanang Pilipino! Mabuhay ang Pilipinas! Conceding defeat to Noynoy Aquino, Sen. Manuel Villar Jr. apologized to the people whom he may have hurt during the campaign. He apologized to his opponents, to their supporters, and to his critics. He didn’t say though when is he going to apologize to his mother. 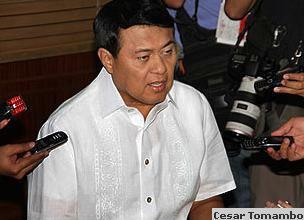 Speaking before the press Tuesday morning, Manny Villar conceded defeat to Noynoy Aquino. In accepting his sorry loss, Villar vowed to support the Aquino administration… by not releasing any psychiatric reports anymore. Sen. Manny Villar has conceded defeat to Noynoy Aquino. There’s no word yet though if Willie Revillame is also conceding defeat to Jobert Sucaldito. Reports say Sen. Richard Gordon was the third presidential candidate to concede defeat. That’s according to news reports. But according to SWS and Pulse Asia, he’s the sixth candidate to do so. Trailing his eight rivals in the official counting, Ang Kapatiran Party standard-bearer JC De Los Reyes has also conceded defeat. K.
In accepting his defeat, administration candidate Gilbert Teodoro said, “I did not fight for a political position for myself but for an idea. Winning or losing is secondary. 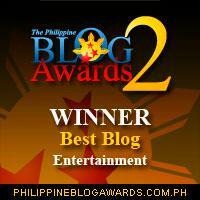 We fight for an idea.” Monitoring Gibô on ANC, Noynoy Aquino inexplicably had a nosebleed. Administration candidate Gilbert Teodoro lost the presidency. Pastor Apollo Quiboloy’s “God” lost its credibility. Boo! As Jejomar Binay leads the counting for vice president, Noynoy Aquino denies reports that some Liberal Party stalwarts have started to abandon his running mate, Mar Roxas. 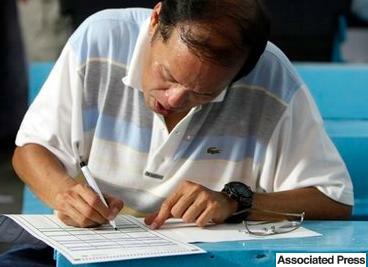 Dissatisfied with Noynoy’s denial, Joey Salceda suggested a loyalty check. Ex-presidential contender turned vice presidential candidate Mar Roxas is losing his bid for the vice presidency… making ex-future First Lady Korina Sanchez the leading candidate for ex-future Second Lady. 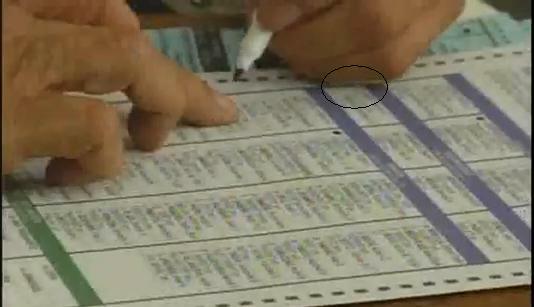 Videos and photos have revealed that Joseph Estrada did not vote for a vice presidential candidate. 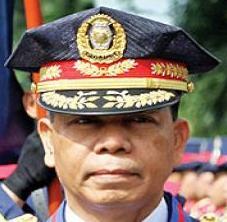 But Estrada’s running mate, Jejomar Binay was unfazed by the reported alleged rejection. After all, he’s got his ‘other’ president. Results of the partial, unofficial count show that Sen. Noynoy Aquino has won the presidency. Finally, he’s got something to write under the column “Achievements” on his curriculum vitaé. Noynoy Aquino has confirmed reports that Dinky Soliman has accepted his offer to become DSWD secretary. Aquino has earlier vowed to reward Soliman with a cabinet post on condition that she won’t sing “If We Hold On (Together)” again. Ano ang pinag-uusapan ng dalawang lalaki sa larawan? Note: This is just a partial dose of my post-elections report. The results from the local voting are next. Plus, a special article on our new president. 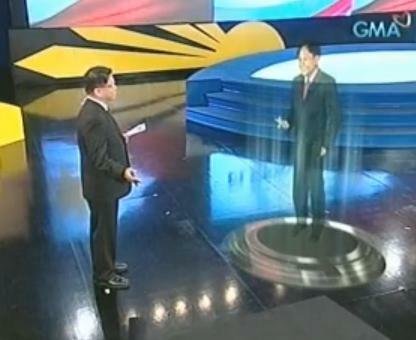 Did you see GMA News’ use of a “hologram” in their election coverage? Award-winning journalist Howie Severino became the first Filipino to be beamed in “a hologram” on live TV. But the feat didn’t impress Noynoy Aquino that much saying he’s seen the same stuff in his favorite PC games. GMA News and Public Affairs ushered in a first on Philippine television. Howie Severino became the first Filipino to be beamed in “a hologram” on live TV. But rumors say it wasn’t really Howie but his boss, Jessica Soho who was supposed to be beamed first during the coverage. There wasn’t just enough ‘beam’ to make it possible. How about ABS-CBN’s high-tech equipment? 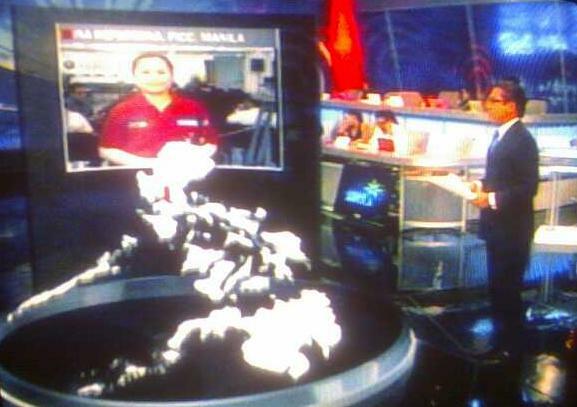 Did you see the huge Philippine map that was projected right in front of the news anchor? Viewers were treated to a rare spectacle when some of the islands on the map started to disappear on live TV – during high tide! Finally… another rumor has it GMA News was not the first news organization to use the idea of “a hologram” to make it appear that a news person is actually there in person while fellow news persons pretend to be in awe while talking to her. That’s exactly what happens every time Korina Sanchez drops by the ABS-CBN Newsroom. Neck-and-neck ang labanan. Kung dalawa na lang ang maglalaban sa pagka-bise presidente, sino ang iboboto mo? Even before the final ballot could be counted, US presidential candidate John McCain has conceded the 2008 presidential election to Democratic rival Barack Obama. That was a quick one. To give you an idea how quick it was, John McCain accepted defeat in less than 48 hours… Sen. Miriam Defensor-Santiago has yet to concede to Fidel Ramos after 16 years. Less than 48 hours after voting began, a new American president was declared. That was fast! To give you an idea how fast it was, John McCain has conceded the presidential race even before Jose De Venecia could sign the copy of the impeachment complaint handed to him three weeks ago. For the first time in television broadcast history, CNN aired a live report beamed through holographic technology. 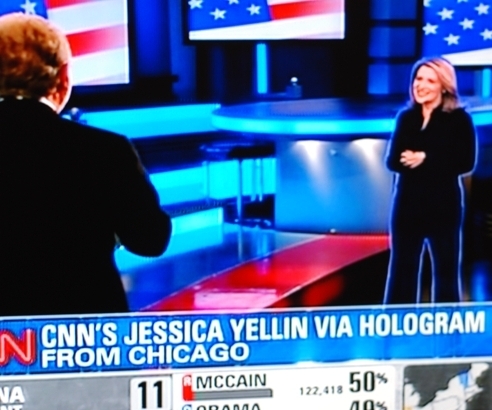 Reporter Jessica Yellin who was in Chicago was projected as a three-dimensional hologram and talked to CNN anchor Wolf Blitzer as if she was in the network’s Manhattan studio. ABS-CBN News is reportedly using a similar technology – not to cover the news, but to prevent physical altercations between Maria Ressa and Luchi Cruz-Valdez during their staff meeting. CNN reporter Jessica Yellin said she was surrounded by 44 cameras and 20 computers as CNN beamed her live report through holographic technology. GMA 7 is reportedly looking forward to duplicating CNN’s unprecedented feat but is nonetheless worried they might use twice the number of cameras in order to beam Jessica Soho live! Author professionalhecklerPosted on AMpWed, 05 Nov 2008 09:06:55 +080006Wednesday 18, 2007 AMpWed, 05 Nov 2008 09:29:08 +080029Wednesday 18, 2007 Tags barack obama, CNN, hologram, holographic technology, impeachment, jessica soho, jessica yellin, john mccain, jose de venecia, lorelei fajardo, philippine politics, political humor, professionalheckler, sen. miriam defensor-santiago, us presidential elections, wolf blitzer23 Comments on OH BAMA!